Oil Reclamation allows you to continue operating. Reliability Services helps you stay ahead of the environmental curve through continuous review of EPA and safety regulations. We make you aware of the latest updates as they apply to your specific operation. And we carry extensive liability insurance. 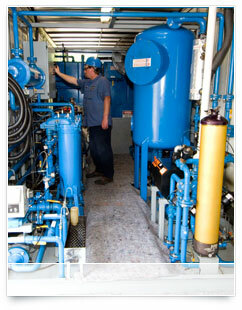 Even if it is not practical or possible to slow down critical systems that need repair until the next scheduled outing‚ we can offer you a short- or long-term purification skid rental to help you continue operating while addressing contamination issues. Oil Reclamation Services and Equipment Rentals from COT-PURITECH's line of services. Cost-effective‚ efficient and environmentally friendly. More reasons why Reliability Services keeps you Up and Running.